All transactions are safe and secure with a reliable history in online purchasing behind each of our associates. Buy the Psycho Drain t-shirt to own Alfred Hitchcock clothing and merchandise. Aaaahhhhh! This Psycho t-shirt says it all. No one can forget the notorious shower scene from the 1960 movie Psycho. Janet Leigh's shrill screams pierced through our ears, while the look of fear in her eyes cut through our hearts. Both engrained themselves in our brains forever. It was a remarkable scene and arguably Hitch's best ever. If you love The Bates Motel and all it conjures up in your mind, make sure you also see the Psycho costume in our gallery. 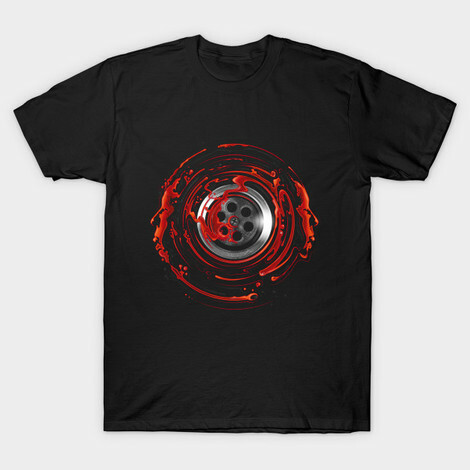 In addition to the Psycho Drain tee above, browse the Alfred Hitchcock Clothing Gallery for more apparel like men's and women's clothes, kids shirts or hoodies.